Please ignore the old newspaper articles and that shopping list in the top left… if Drew and Unicron would like to join all my fans (As you can see, I have a picture of my fans to remind me who I’m writing for :3) then that’s great don’t forget the post-it note that says “<3 Unicron7022 & Drewbian” Then I put Dosh coins under it to subliminally remind them to give me free Dosh. So this is where I work and spend my time making sure to get these reviews out ASAP! Hope you enjoy this week’s review! 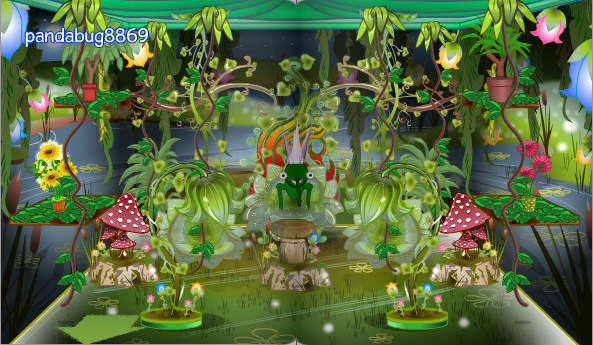 This week’s Best Nest featured pandabug8869’s forest room. This is a room that looks as if every corner has been filled with whatever pandabug8869 could find and to be honest… I’m okay with that. It’s a forest, you don’t exactly expect them to be tidy now; unless you do, in which case, that’s just weird. I honestly can’t describe why I chose this one but I feel it’s something about how it looks like an overgrown, magical woodland. I can’t really comment on whether it all fits together or not because to me, it seems to be in the middle, the wallpaper and floor don’t match but at the same time, they kinda do. There’s a ton of different themes that have been piled into this room and none of them would go together in any normal circumstance, however, this time they seem to have all worked together well and created this amazing kitchen. P.S We now have our very own nest rooms page and we would love you to send in your nest rooms so we can display them! Click HERE to visit it. New Japanese Nest Items At Nestco! This is a fab bonus for Bin Tycoons – brand-new Japanese nest items have arrived at Nestco and they’re available to only Bin Tycoons for two weeks. What’s more, you’ll also receive double XP, how awesome is that? There’s a large range of the Japanese nest items to choose from and I’m sure the Nest Inspector will be on a close lookout for some Bin-tastic Japanese nest rooms! Indeed, that’s my Japanese nest room which I created, using my superb nest designing! I would love to hear what you think of it, as you can see from above, I’ve mixed and matched nest items from differant themes, I particularly thought the nest items from the Safari set seem to blend in nicely, so I used the wall stickers and the carpet rug from the Safari theme. The mini Tink’s Trees also go quite nicely in this nest room, so I’ve added two of them. Do you have a Japanese nest room? If so, you can submit it to our nest rooms page and it’ll be displayed for everyone to see! It’s Scribbles Bin Birthday – Collect A Free Nest Item! Weevily wow, the big day has come! Your favourite newshound, Scribbles, is celebrating his Bin Birthday today! We at Bin Weevil Company, we would like to take this chance to say the following to Scribbles: We wish you a Happy Birthday, we wish you a Happy Birthday, we wish you a Happy Birthday dear Scribbles! Do you want even more Bin-tastic codes? They might give you XP or Mulch or nest items, sometimes all three at once! To view a complete list of codes, why not visit our secret codes page? A Look At hf556’s Tink Themed Room! I quite like how I’ve mixed and matched different themes together and in total, I think the room’s come out pretty well! Feel free to comment down below some reviews of my newest room and I may add them to this page! This made me lift an eyebrow. You’ve mixed colours that compliment eachother nicely. Even though I can tell you tried to use all the space you could, it doesn’t seem crowded at all or as if the whole shopping mall exploded inside your nest. I can see you’ve gone for a symmetrical design which has worked. Overall, it’s a good room. Best Nest Issue #104 Review! How are you all enjoying your first couple of days back to School? A new update is coming to the Summer Fair today, you will earn double the amount of tokens you would usually earn on each game! There are some awesome Summer Fair nest rooms inside this issue and we’ve picked out two and we’re going to give a review about them. 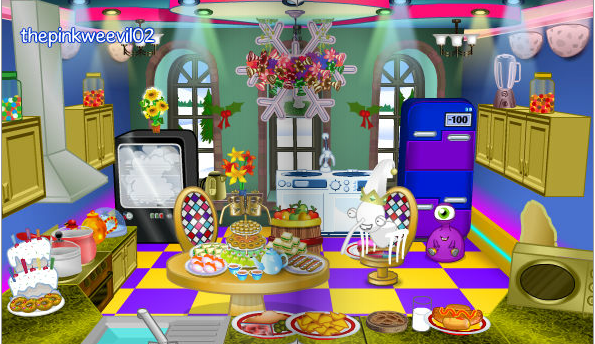 This is a really awesome and Bin-tastic Scribbles themed room! The green seashells really caught my eye, they’re a great feature in this nest room. Did you know? The Scribbles chairs were designed by callum390! The three Scribbles wall stickers on the right-hand side look really awesome. I really like this kitchen, it has the sort of Summer feeling to it. The four icecream sundaes on the ‘looking good enough to eat’ table is a great idea and weevily wow, this player has already been featured in Best Nest, so this is probably their second time! The floor makes the room look awesome. Get Ready To Submit Your Nests to The Nest Inspector! It’s almost the first Day of the month and you know what that means for most Weevils… it’s almost time to send off your Bin-tastic nests to the Nest Inspector! Weevily wow, hasn’t this month gone fast? I have been quite busy, updating my kitchen nest room with a new theme. I’m hoping my nest’ll get a Gold Bin Nest Trophy. What do you think of my kitchen nest room? Here’s a picture of it. With this kitchen theme, I tried to make it a sort of black and white rock ‘n’ roll theme, and I think it;s turned out quite well. I’m still a bit unsure about the red ceiling though, do you think it blends in alright with the theme? Make sure you get all your Bin-tastic nest rooms ready to submit! 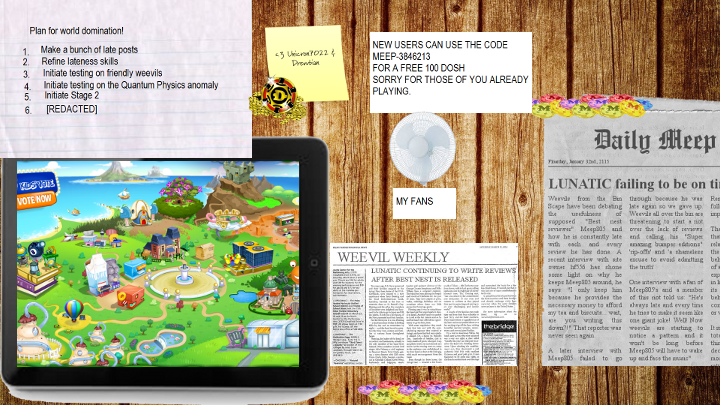 Some of you lucky Bin Weevils will get your nest featured in Best Nest, or maybe even the Bin Weevils Magazine! I got featured in Best Nest once. A look at Eddzy’s new Easter room! Easter is nearly with us and with the egg-cellent Easter Shop that appeared in the Shopping Mall yesterday, the season would be even more exciting! After hours of hard work, jumbling different nest items together, I’ve finally completed my Easter room and it’s ready to present to you all. What do you think of my nest room? Is it good enough to make it into Best Nest or do you think I’ll gain a silver Bin nest trophy for all my hard work? Tell us below what you think, I look forward to hearing your thoughts! St. Patricks Day Party Details and hf556’s St. Patricks Day Nest Room! There’s not long to St. Patrick’s Day now, six more days, so I thought we could celebrate by having a Bin-tastic St. Patrick’s Day Party on Bin Weevils! I hope you will all come to our St. Patrick’s Day Party on Bin Weevils and it would be awesome if you could all change your Bin Weevils colour to green! If you read Eddzy’s post, you will know that there’s now some Bin-tastic St. Patrick’s Day nest items on sale at Nestco! Make sure to weevil on over and get them! I have recently been working hard on a new St. Patrick’s Day nest room, adapted with my Scribbles themed room! I hope you like it, here it is. What do you think of my St. Patrick’s Day nest room? I think it’s very ‘green themed’, and that’s what St. Patrick’s Day is. Leave your thoughts below! Please could you re-blog and share this post onto social networking sites, the more people at the party, the more better it will be! Look forward to seeing you there. Go Green with St Patrick’s Day Items! It’s time to go green as many people around the world including Ireland will be celebrating St Patrick’s Day on March, 17th! Why not change your colour to green on Bin Weevils? Check out the new St Partick’s Day nest items that are on stock! There’s lighting, wallpapers, rugs and pots of gold to purchase from the collection. Did you know? To make it easier for you all, Bin Weevils have added a ‘Go Green’ nest item bundle containing a wallpaper, a rug and a pot of gold. What do you think of my St Patrick’s Day room? Leave your thoughts in the comments section below, maybe you could give me a top tip on how to make this nest room even more brilliant!